I asked you all on Facebook what makeup tutorial you wanted to see next, and the majority of you all said how to contour! I definitely am super excited about this video because contouring can be difficult to master. There are endless amounts of how to contour tutorials out there. You can contour with creams, or powders, or a mixture of both. It’s kind of hard to navigate through the tutorials to find something that seems easy and doable. I feel like my method is perfect for every day wear, and it’s very natural. HOW TO CONTOUR: and make it look NATURAL! 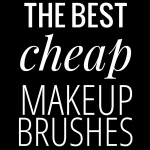 Obviously after that, you’ll want a blush and a highlighter… and those are totally to your preference! In this video, we’ve got two things going on. One, I talk about my favorite products that I would recommend for how to contour. I even have 2 drugstore recommendations! Two, after the product talk, I jump straight into the tutorial, where I demonstrate how I highlight and contour most days. If you want to see the demo, skip ahead to 3:40 in the video. This video is a little longer just because I go pretty in depth and recommend a lot of different products! Nars Ita Brush Knockoff that I can’t find anymore. Maybe buy the real thing on eBay? I hope this helped you to learn how to contour! Be sure to check out the entire beauty section before you go! I’ve been waiting for this ever since you asked on Facebook. Thanks!!! Can I contour without concealer and foundation? I don’t like a lot of stuff on my face, usually use just blush. So I was thinking to use one of the palettes and contour too. I don’t see why not! You could just bronze the face and then contour the cheeks, temples, and jawline! Then maybe use one of the lighter powders in one of the palettes to highlight a bit under the eyes. How do you remember all the names of these products girl! I don’t even remember the name of the one pink shadow I’ve used for 3 years! This was super helpful. You’re making me want to try new things with my makeup. YES this is so helpful! 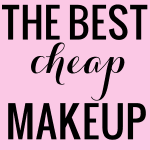 I love that you included the cheap drugstore versions too haha. I still can’t see myself doing this daily but this is a perfect tutorial for when I want to look extra sharp. Yay! Thank you! Yay! So glad that this was helpful! Yeah, I go into great detail here, and once you get it down it really doesn’t take that much time. But just bronzing up the face really helps with dimension when you are in a pinch! Thank you so much!! I’m glad it was helpful! !